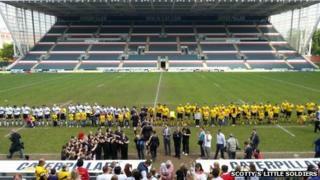 Organisers of a charity rugby match are claiming a world record after two teams played for almost 25 hours. 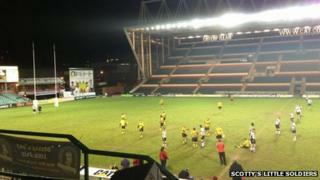 A team from the charity Scotty's Little Soldiers played against the Armed Forces at Leicester Tigers' stadium. The full contact game had to last from 11:00 BST on Friday until 13:00 on Saturday to beat the previous record held by Congleton Rugby Club. 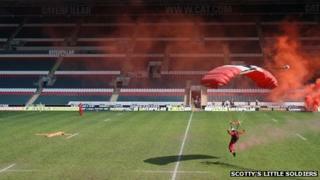 The game raised £50,000 for the the charity which supports children who have lost a parent in the Armed Forces. It was established by mum-of-two Nikki Scott, whose husband Cpl Lee Scott was killed in Afghanistan. The charity is backed by former Tiger and England international Ben Kay and Leicester's Louis Deacon picked it as one of his testimonial charities. On Saturday the teams played for 24 hours and 50 minutes and scored 2,570 points between them. The previous longest ever rugby union match lasted 24 hours and 30 minutes. Organiser Alan Knell said: "It has been an emotional 24 hours. We had a lot of injuries overnight, and some were quite nasty, so we were down to the bare bones of the team that could play. "The lads are hurting but they don't care - we have broken the world record."